Art cards available in the gift shop. A selection of Karen's art cards and prints are available in this unique shop. Look for the owls! A small selection of art cards, framed and unframed press prints in this tastefully arranged hair salon on mainstreet in Blairmore`s east end. You can purchase my art cards here, then go check out the wild stories that make up the history of this beautiful area: the opening up of a passage through the Rocky Mountains with the CPR railway, coal mining, bootlegging, disasters, immigration, mail-order brides, unions, communism...it`s crazy. It`s colourful. 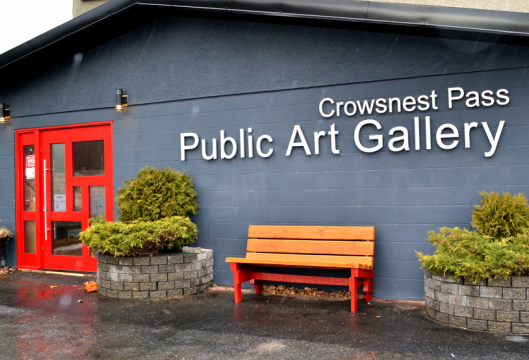 It`s the Crowsnest. A selection of Karen's original paintings, limited edition giclees and art cards can be found in this popular gallery, run by artists for artists. This beautiful old mansion also houses the Allied Arts Association's Public Art Gallery.